Westerners, I swear. The sheer arrogance. You think you're the only ones on Earth? You pillage and you butcher in your god's name. But you're not the only religion, and he's not the only god. And now you think you can just rip the planet apart? You're wrong. There are billions of us. And we were here first. If anyone gets to end this world, it's me. Kali is a Hindu goddess and one of the gods who meets to try to work out a way to stop the coming Judeo-Christian Apocalypse at the Elysian Fields Hotel. Along with Baldur, she appears to be one of the most powerful of the gods. She has previously had a relationship with Gabriel, when she thought he was a trickster named Loki. Kali appeared as a middle-aged Indian woman with brown hair and eyes. She is dressed in a black skirt and red top with a belt with skulls on it, which symbolizes her true Hindu form. Kali can make humans and other gods choke on their own blood just by looking at them. She can bind people and even archangels to her presence by gathering their blood. Kali has the ability of pyrokinesis. She can summon flames on her arms and use them to immolate her enemies. Kali as she appears in lore. Taking Gabriel to the other gods, she kills him to show the remaining gods that with an archangel blade, the gods can ultimately kill Lucifer. Unknown to her, however, Gabriel's blade was a fake, and Mercury would betray the rest of the gods and sell them out to Lucifer. As Lucifer begins his killing spree, he kills all the gods except Kali, who is able to get off a single attack on Lucifer, which did little to no damage to the archangel. On Gabriel's urging, she escaped with Sam and Dean, while Gabriel confronted Lucifer. Kali (literally "black" in feminine form, sometime it means "time") is a Hindu goddess associated with eternal energy and death. 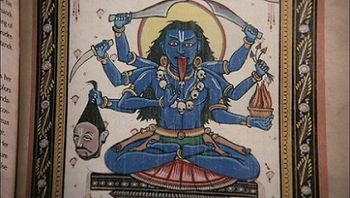 Kali is known as a terrible, vicious, slayer of demons. She is also known as the Dark Mother or Dark Goddess. She has four arms, and although she is black, she is often portrayed as blue, and usually naked. This page was last edited on 8 November 2018, at 03:44.